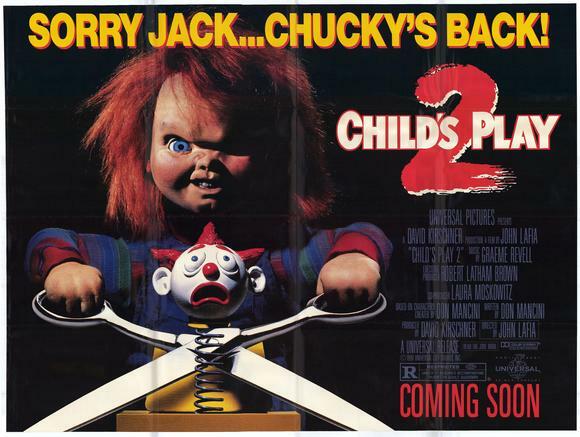 After the events of Child’s Play, Andy Barclay (Alex Vincent) was placed in a foster home with Joanne and Phil Simpson while his mother underwent psychiatric evaluations, because she supported her son’s story about a killer doll. Two years have passed since Chucky was destroyed and the bad publicity about Play Pals, Inc. (the company behind the “Good Guy” toy line) is all over the newspapers. The company has the original doll reconstructed for analysis and a worker is electrocuted. 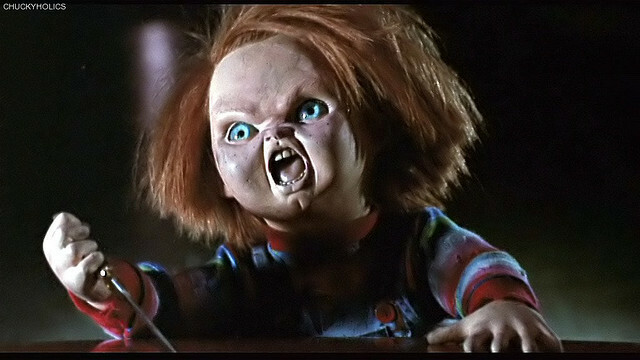 Chucky is brought back to life because of the accident and kills a client of Mr. Sullivan’s, named Mattson, to find details of Andy’s location. Chucky disposes with and takes the place of the foster home’s Tommy doll by destroying it with Joanne’s priceless China ornament. That night, Chucky ties Andy up so he can finish what was started in Child’s Play; the transferal of his soul into Andy’s body. But Kyle, Andy’s foster sister, is sneaking back into the house through his bedroom window and she interrupts the process. Confused, Kyle tries to help untie Andy, but Phil and Joanne unexpectedly arrive and accuse her of tying Andy up. Phil then throws the doll into the basement. In the middle of the night, Andy hears a noise downstairs. He arms himself with an electric carving knife and heads into the basement. Chucky wrestles with Andy, until Phil suddenly comes in and notices Andy holding the knife. Andy tries to warn him before he can walk down the steps, but Chucky trips him and leaves him dangling on the edge of the stairs, before dropping him, killing him from a broken neck. Believing Andy responsible for the murder, Joanne angrily packs his things and sends him back to the foster care center. Kyle, knowing that Andy didn’t kill Phil on purpose, tries unsuccessfully to reason with her and decides to have a cigarette outside, throwing Chucky into a garbage can. In using the tree swing, she accidentally uncovers the original Tommy doll, buried in the dirt. She then notices that the garbage can she tossed Chucky into is empty, causing her to realize that Andy was telling the truth. Terrified, she runs back into the house to warn Joanne, but discovers her dead body tied to a chair. Chucky reveals himself and threatens to kill Kyle, unless she cooperates. Will Andy and Kyle survive to tell the tale? “Child’s Play 2” does what every good sequel should do: it tries to advance the story while stay true to the origins of the original. Alex Vincent is, once again, great as our “boy in trouble” Andy and newcomer Christine Elise is perfect as his foster care rebel “step sister” Kyle. Nonetheless, this movie does have a damn amazing end set piece in a toy factory making…wait for it…good guy dolls. The film lasts just 84 minutes and is probably the most fun you will have out of any of the sequels while still being entertained AND scared…something that is forgotten about in later installments.